April 16/19 – Lots going on!! The Muskrats are building their nests, the Swans are migrating through as are the Canada Geese – some deciding if they should nest here. 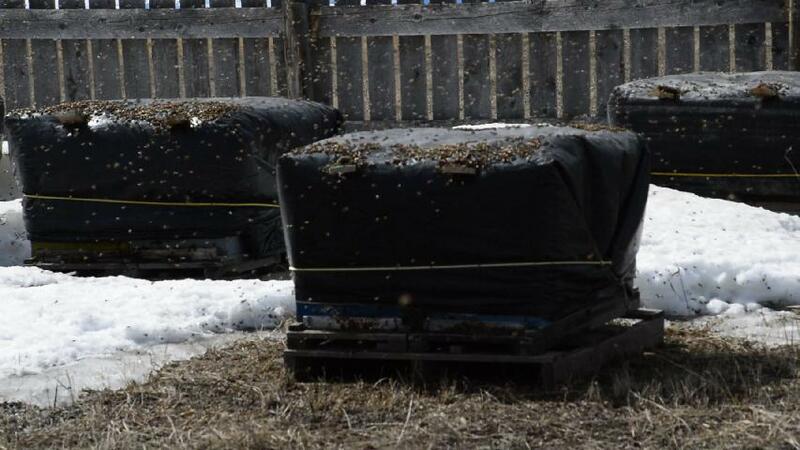 The bee hives are finally out from under the snow, and the bees are very active. The bee keepers brought a sugar barrel for them to feed on till the flowers bloom – for once I’m looking forward to dandelions! The spring lakes are showing lovely reflections on calm days.The Ducks are walking around trying to decide where to nest. We even had a couple of Sandhill Cranes visit – that was a treat. The Magpies built a huge nest in our chokecherry tree – I wonder if they’re going to use it this year. And…. check out the bee movie below. March 26/19 – Birds are returning. WOW….is there ever a lot going on at your property! Bees scare me because of a bad encounter with a wasp nest as a child. But so important that you support having them on your property as they are so essential to our ecosystem. All that wonderful nature and animals/birds/bees on your property must be so good for the soul for you and Waldy. Good Morning Marlene. You are way ahead of us with your spring. Still some snow along the fence lines and while walking through my cemetery yesterday to see what needs doing, there was snow&ice still laying about in the low spots. Clean up will start next week. While it is still frosty at night the days are warming up to mid teens. The only birds back so far are the grackles, red wings and robins. I really look for the hummingbirds, another month. Switched over the last of the snow tires yesterday so T shirts and shorts are close. Have a good Easter Weekend. Yes, you certainly have a lot of activity going on. Lots of bees and wildlife. Our grass is getting green; rain barrels are out and full of water; daffodils are coming up; birds nesting in the bird boxes. So looking forward to my visit – 3 weeks today. Happy Easter!